JUPITER, FL, Nov. 17, 2012 – When you’ve won eight championships, pitching is more often than not the key to victory, but this time Southern Maryland Fedlock enjoyed a bit of good fortune as well. Tom Reed out-dueled a quartet of Royals’ pitchers, tossing an eight hitter and not allowing a run after the fourth inning, and Pete Cressey scored the game-winning run with one out in the bottom of the ninth as Fedlock claimed yet another title in dramatic fashion. Cross was referring to Mark Krutchton’s line single to left over a drawn-in outfield that plated Cressey with the winning run. He was also referring to a bizarre turn of events that made the rookie’s hit possible. Cressey led off the bottom of the ninth with a clean single to left center and was promptly sacrificed to second. With the winning run in scoring position, Puerto Rico manager Jose Castrillo opted for an intentional walk to put his defense in position for a potential inning-ending double play. What Castrillo forgot however, is that his Royals had already used their one and only intentional walk earlier in the game. When losing pitcher Miguel Rivera threw the first intentional ball, the home plate umpire immediately called a team balk, moving Cressey to third. 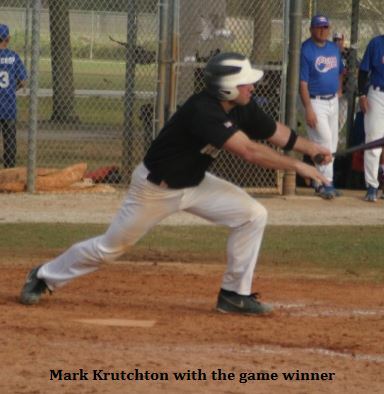 Krutchton’s liner to left landed beyond the drawn-in outfield and Fedlock had its title. A bases-loaded error and Castrillo’s two-out, RBI single tied the game at 3-3 in the fourth inning. Despite each team having opportunities, neither team scored throughout a tense final five innings. Mike Garrison’s hard liner with runners at first and third and one-out in the seventh was turned into a 4-5 double play to erase one Fedlock threat, before Southern Maryland failed to score with runners at second and third in the eighth. Reed was just as tough on Puerto Rico batters in the clutch, limiting the damage to two runs in the fourth and escaping a huge jam in the ninth when he snagged a comebacker to start a 1-6-3 double play with runners on first and third with one out. “That hurt,” Castrillo said. “That was a big chance for us to get the lead and when we didn’t there was a letdown.” For Reed, while the key double play was critical, the big right hander knew all along that to win, he’d need to be nearly unhittable. Puerto Rico, which finished round-robin play 3-1-1, including a convincing 10-2 victory over Southern Maryland, used Edgardo Mercado’s strong seven innings to shut down the Suncoast Stars 5-0 in the playoffs and reach the finals. Once there, the Royals wasted little time, scoring the game’s first run, when Luis Ortiz drove home Nelso Erazo with a two-out single to center. Fedlock returned the favor, scoring a trio of runs off Puerto Rico starter Carmelo Morges. Ray Lloyd, whose 5-0 complete game shutout of the Maine Diamond Dogs got Southern Maryland into the final, singled home Garrison just ahead of the throw, before Fred Villegas’ bloop single to center plated Steve Zumpano and Eddie Fuller.